The day was planned to return to a similar area as our outing last August, and include some towers which had not been available on that day. 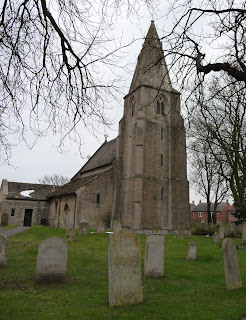 Having driven on the A1 past Wittering on many occasions, it was a surprise to realise that there is a church with ringable bells as well as the RAF base, so that was our first stop of the day. Poor Geoff suffered an April Fool jest in the form of a flat tyre on the A1, but he managed to fit the spare and continued at a reduced speed. 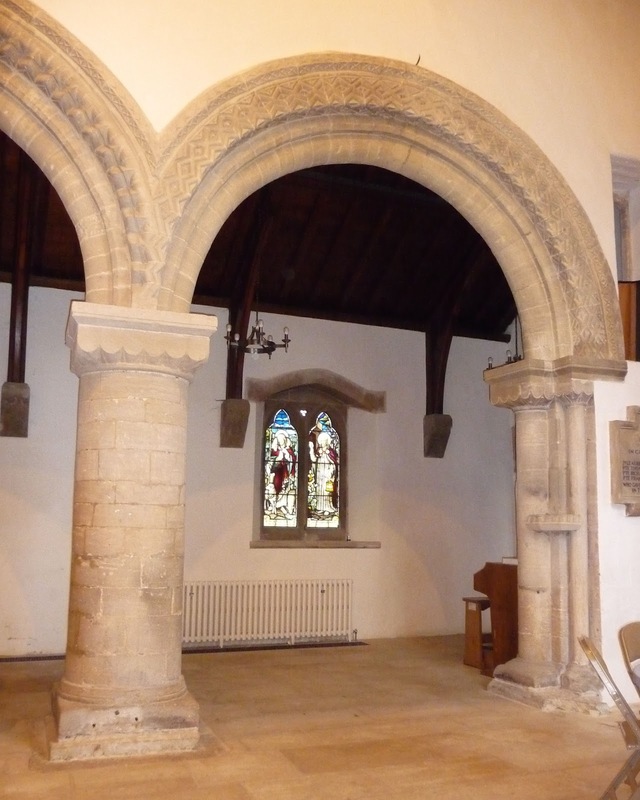 Wittering church is not large, and has a stunning Saxon arcade and a compact, stone-floored ringing chamber. Single Canterbury was the method here, to allow for the long draught and rather flighty bells. 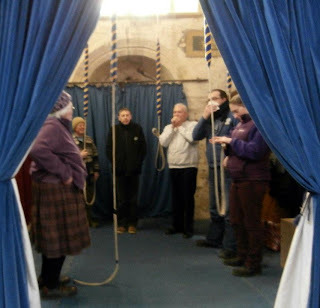 The first attempt came into rounds prematurely, so we stopped, rearranged the band to provide adjacent ringers with compatible rope-handling styles, and set off again. All was well at the second attempt, and this was a first in method for Geoff. 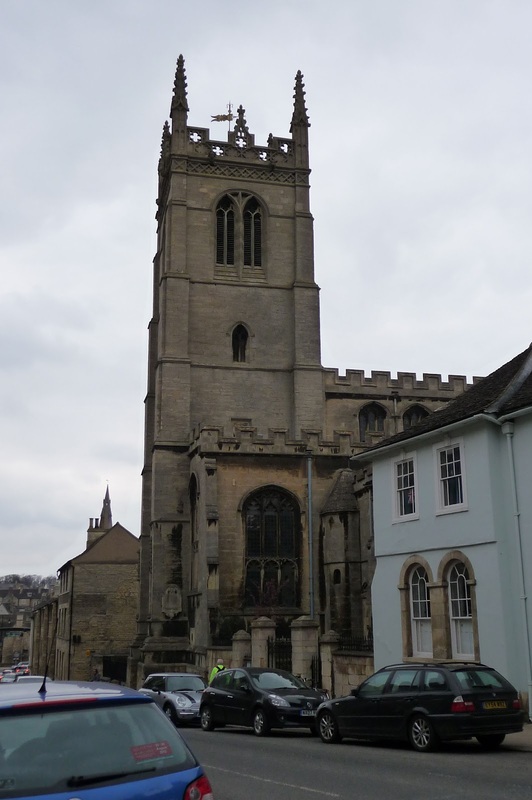 The second tower was St Martin's, Stamford, on the south side of the town. 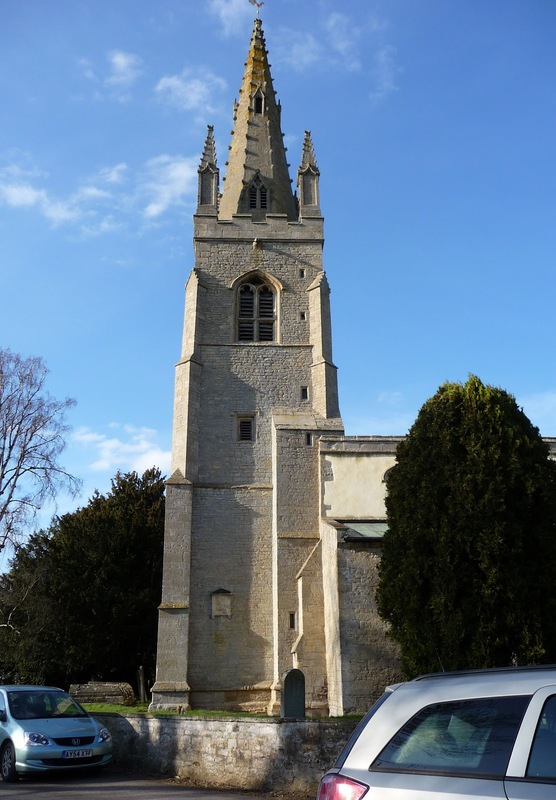 This was a complete contrast in every way - a large and imposing church, an upstairs ringing chamber with low ceiling and short draught, and a carpet on the floor. The fitting for the gas light is still in place in the ringing chamber. 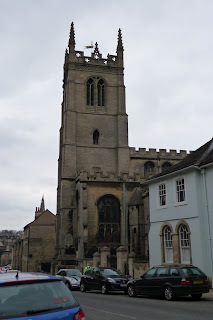 We rang Cambridge here, with the bells sounding out across the town. The Bertie Arms at Uffington was chosen for lunch almost entirely on the basis of its location between the second and third towers of the day. 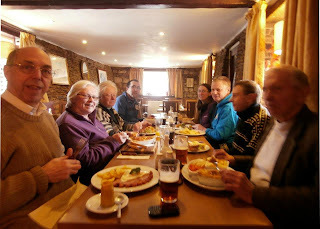 But it proved to be a good choice, with a warm welcome, open fires, a good range of options on the menu and cheerful, speedy service. Our waitress even offered to take the group photo. Baston is an anticlockwise ring, with the entrance to the ground floor ringing chamber through a narrow gap behind the organ. The clock weights descend through a trap door into a cage in the ringing chamber, and it is recommended that the trap door is closed before ringing, to reduce the sound levels, but this is not possible if the weights are too far down. The usual clock winder was away for the weekend, so the local ringers kindly wound up the clock so we could close the trap door. Norwich was the method here. The combination of the after-lunch effect and the anticlockwise ring was almost too much for us. After some good ringing, coming into rounds was a bit shaky as people tended to look the wrong way, but the quarter was successfully scored. 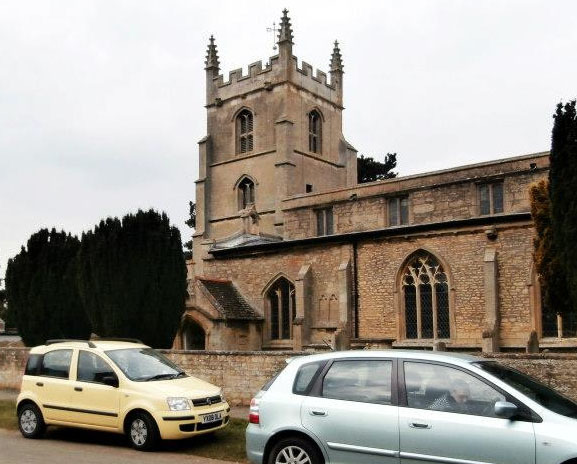 At West Deeping we had to collect the key from a nearby house. 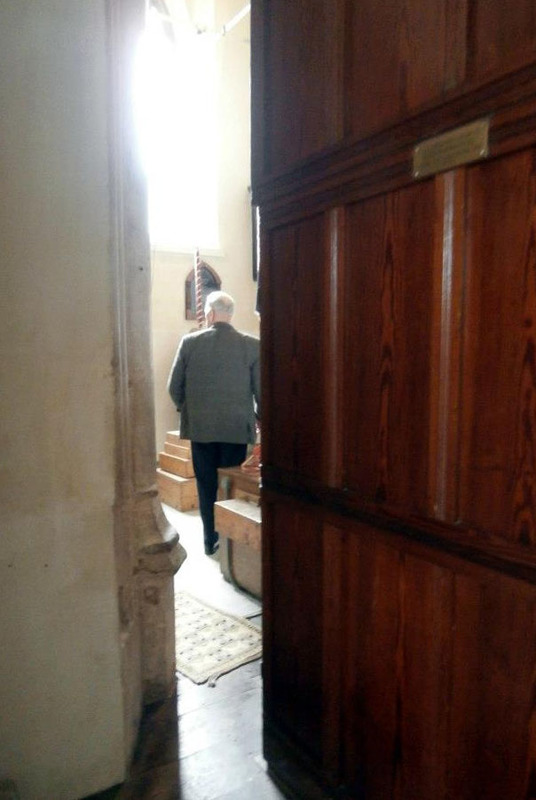 On arriving at the church, we found the main door propped open, perhaps in the hope that the sun would shine and some heat would get inside. But the sun was not shining and it was exactly as cold inside the church as outside. Furthermore, we were advised to open the tower door so we could hear the bells better, and this resulted in a cold draught down the stairs. We rang Netherseale; Phil started the quarter in his scarf but found he was strangling himself and had to ask Geoff to remove it while he was ringing. Once that was sorted out, and some minor method issues were resolved, we rang a decent quarter. By the time we finished ringing, the sun had come out and the wind got up. On returning the key, the keyholder was very concerned as she had not heard the bells and wondered if there had been a problem. But we reassured her that all was well and it was just the wind being in the wrong direction. 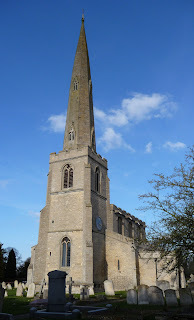 Glinton was the final tower of the day, and, on entering the church, everyone commented on how warm it was inside. When we explained that we had been ringing at West Deeping, the local ringers understood just how we felt. We rang Grandsire, with the sun coming in the west window, and Janet took her hat off for the first time in the day. 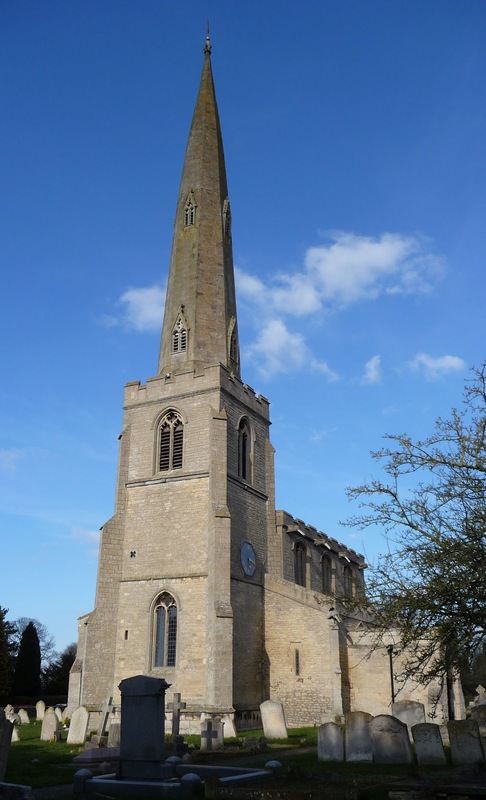 Details of the quarter peals are here: Wittering, Stamford - St Martin, Baston, West Deeping, Glinton. 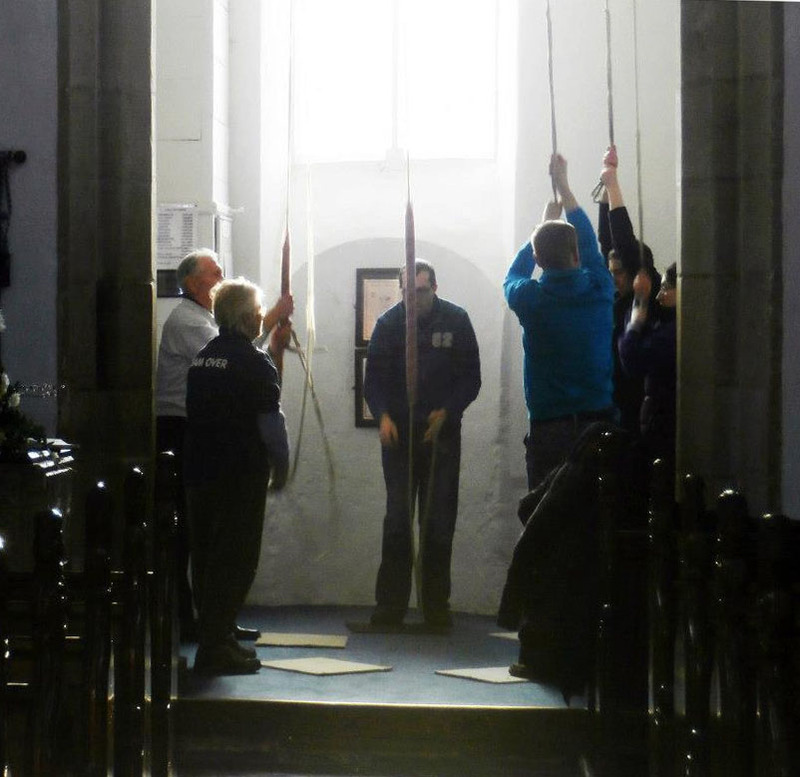 All the quarters were rung for Easter, and at some of the churches this was the first Easter ringing. Thanks to the incumbents for permission to ring, and to the local ringers and key holders for making us welcome and ensuring that we had a good ring on their bells. Thanks to Geoff and Janet for the photos.